The Logo of the organisation shall be a right hand Black clenched fist facing forward with a Red Star imposed on the Wrist on a Gold Background. The flag of the organisation shall be a rectangle with the horizontal side being the longest. A diagonal line from the bottom left hand corner divides the rectangle into two triangles. The upper triangle shall be Gold and the lower triangle shall Black. A Red Star is imposed on the top left hand corner. 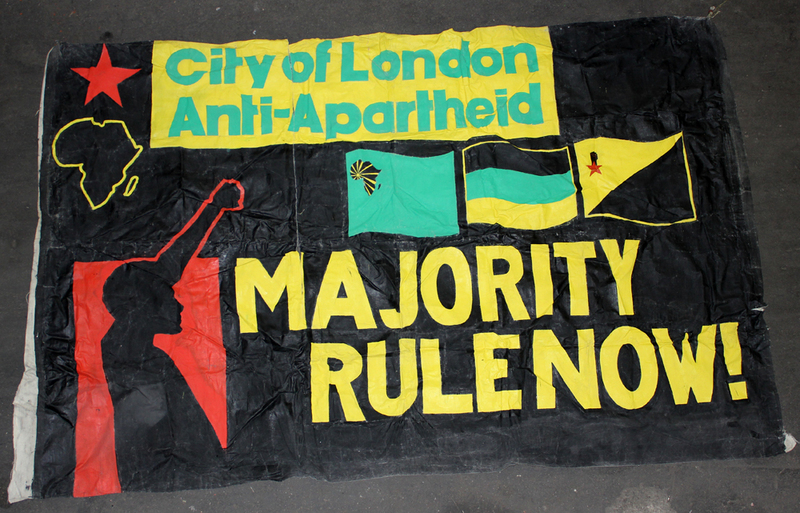 A somewhat different flag design is shown on a banner (seen on a photo here) which was originally used in the anti-apartheid protests in London, United Kingdom in the 1980s. Her the star in the canton is replaced with the complete logo. As the use of such flags has not been verified with no photos so far, the design should be considered a flagoid for now. A flag charged with the party logo on gold field also exists, but is rarely seen. Its only photo can be found here and shows the logo accompanied with the abbreviation AZAPO in black within a thin black ring, all on gold field. The same design, only without the ring, has appeared as the illustration in a newspaper article photographed here. However, this variant's use as a flag has not been verified so far, although Wikipedia currently displays such an image as the party flag but the cited source is no longer available online, so it should also be considered a flagoid for now.